Apparently no one told the Atlanta rapper about his award. In January Young Thug's video for "Wyclef Jean" went viral after director Ryan Staake produced the whole project without Thugger, who never showed up for the shoot. Despite the Atlanta rapper's absence, the video produced by Pomp&Clout gained over 28 million views and earned a VMA for Best Editing on Sunday night. 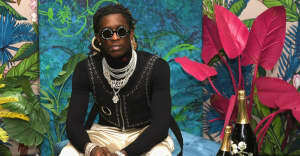 Unfortunately no one got word to Young Thug, and the rapper didn't find out until Monday that he had won his first VMA. Regardless of how you feel about the video, this shows that Young Thug can bring in accolades without even knowing. So no one was going to tell me that I won an award?? Watch the award-winning video above. Check out The FADER's Young Thug cover story here.